MPB occurs due to hair follicle sensitivity to a hormone know as Dihydrotestosterone (DHT) that occurs naturally in all human beings. DHT is synthesized from testosterone in the hair follicles, prostate, testes and adrenal glands and is important for the development of typical male characteristics during puberty. The DHT hormone has been proven to be the culprit in hair thinning and hair loss and always occurs in a specific pattern. 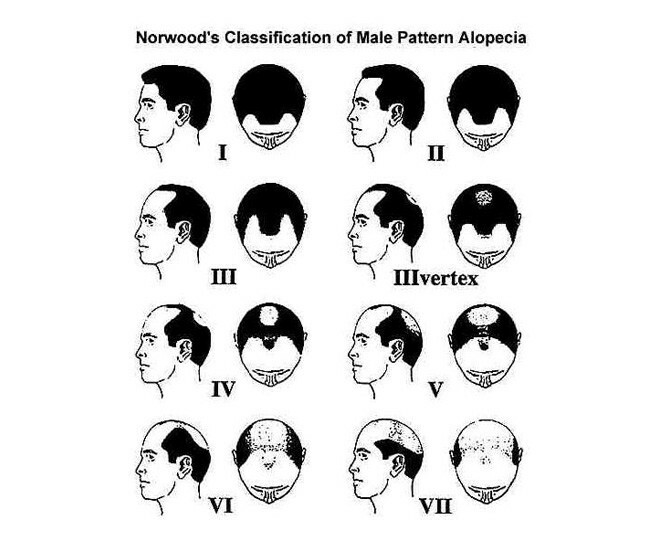 To the right is an image of the Norwood Classification of MPB showing variations and stages 1 to 7 of typical patterns described. As you may have noticed, the hair at the back of one’s head is never lost as these hair follicles are embriologically immune to DHT. Even in men with severe MPB, the “horse shoe” pattern of hair at the back of the head always remains. In hair transplant surgery, we are able to take advantage of this fact and can simply move these DHT immune hair follicles to your balding areas. These hairs will never fall out and are permanent.